I like stories and I like meeting people. And I really like storytellers, and how the stories they tell can evolve and inform you, and sometimes surprise you too. I also like islands, have some island blood flowing through me, and like the stories islands have to tell. So here’s a story about an island that lies hidden behind another island. And a wee bit about the storyteller, an islander, sadly now passed away. 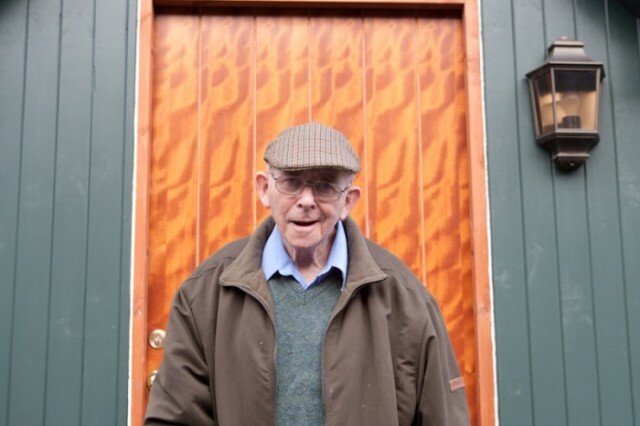 But when I photographed Lachie MacLean beside his home, at Knock Farm on the Island of Mull, despite being over 80 years old and fighting Parkinson’s Disease, he was still able to tell a tale or two. Lachie had farmed this area all his life, and his son Donald still carries on that tradition today. This portrait was taken of Lachie and his dogs just after the cottage he’d spent over 60 years in had been knocked down only a few days previously, all that remained was an empty space and some marks on the wall where it abutted the barn. But the new cottage was built, and starting to create it’s own history. In the sea loch beyond Lachie’s farm lies a small island. Inch Kenneth. Easily overlooked. No ferries. Not any kind of destination, except for a few seakayakers and sailors. I’ve kayaked there numerous times. There’s one big house, and a wonderful old ruined chapel on the island, reputedly used as a burial place for several Scottish kings when weather and sea prevented passage to Iona. The stones found around the chapel commemorate the MacLeans and many stones have intricate carvings of animals, plant scrolls, ring knots, galleys and swords, and are from the 14th, 15th and 16th century. 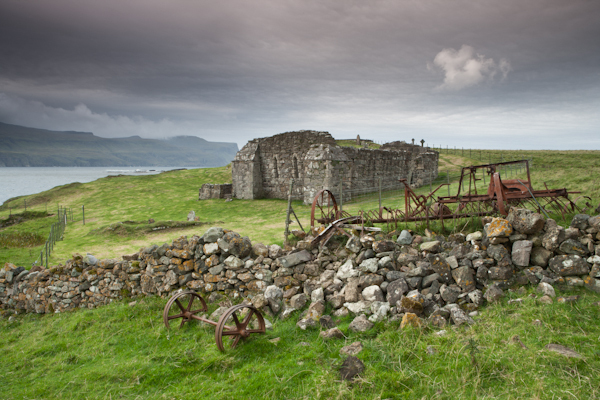 It is a wonderfully atmospheric location, surrounded on three sides by the sprawling bulk of the Isle of Mull. The last time I visited, kayaking alone to gather images for a book, I narrowly avoided being trapped there by unbelievably sudden and vicious katabatic winds sweeping off the cliffs of Gribun nearby. A beautiful place but with an ‘edge’ that Atlantic-facing locations often possess. But that’s all part of my story of the island, here’s a small part of the story of Inch Kenneth that Lachie had to tell. The island used to belong to the family of Lord Redesdale, the Mitfords. They had six daughters and a son. One daughter, Diana Mitford, married Oswald Mosley (British Union of Fascists). Their fourth daughter was Unity Mitford. Her full name was Unity Valkyrie Mitford. She moved to Germany in the 1930’s and at one point had an affair with an Austro-Hungarian aristocrat who was also reputed to be a German spy, Count Almasy. She was obsessed by the Third Reich, and eventually Unity became Hitler’s mistress. When war broke out between the two countries she adored, Britain and Germany, Unity was devastated, and taking Hitler’s luger, shot herself in the head. But her suicide attempt failed, and she did not kill herself. Suffering brain damage which caused a personality change, and with the bullet still lodged in her head, Hitler had her returned to the UK and her family. It is claimed that Hitler telephoned regularly to check on her condition. Eventually Unity was brought north to the big house on Inch Kenneth (the only house on the island) to convalesce, and spent the rest of her life there, a further ten years during which she became a well-known figure on mainland Mull, coming across for dances and ceilidhs. She finally died of meningitis in 1948, aged only 33. Then the island of Inch Kenneth was sold to the Barlows, the grandson of Charles Darwin. A good friend of the Barlow family is John Berger the filmmaker, photographer and writer. He has been a frequent visitor to the island. Some of you may remember his tv series ‘Ways of Seeing’. There is an accompanying book which is a fairly well known reference for photographers and other visual artists and one I have long had on my bookshelf. Anyway Lachie describes how a large group of creative types descended on Inch Kenneth one year: Berger and his friends making a film with german and english actors. Lachie was slightly involved in this production, as they used some of his sheep for a few scenes in the film. Lachie has often kept stock on Inch Kenneth, and once told me a wonderfully hair raising tale of trying to take several uncooperative cows across in a small boat. But Lachie’s love of a story led him into a conversation with one of Berger’s entourage. He related to Lachie how Berger had entertained one of his good friends, a writer, with atmospheric tales about Inch Kenneth, about Unity Mitford, Count Almasy, spying, the War, Hitler, love, romance, intrigue, death and mystery. And the ‘writer friend’ was intrigued and inspired by the tale. So inspired in fact that he wrote his own version of the story. You may have come across it? His name was Michael Ondaatje. Islands. They hold stories. And they create stories. This article first appeared on Duckrabbit. Republished with kind permission of the author. John MacPherson was born on the Scottish west coast. He has been involved in professional photography for over thirty years. He has travelled extensively, having bicycled across the USA, motorcycled through significant parts of North America, learned (and taught) stained glass window design and manufacture, trained as a disabled ski instructor and Alpine Ski Leader, been shot at, held captive by a dog's hairdresser (male) in a mobile home in Texas, subdued a knife-wielding but very stupid man, narrowly escaped a tornado, been rammed by a basking shark, bitten by a wild otter, caught in an erupting volcano, avalanched, and hit by lightning, amongst other things.